Michael Amadori looks into a fish tank growing tilapia in a lab at the State University of New York. The fish waste is used to grow lettuce. If, in a few years, you are suddenly overcome with a sense that there's something fishy about the lettuce in your salad, you might be on to something. There's a chance it was grown with fish poop. "There's no fish taste whatsoever," Michael Amadori, a master's student in ecological engineering at the State University of New York's College of Environmental Science and Forestry, assured me Wednesday. Americans throw out about 25 percent of their food, he noted, a fact that led him to ask: "Can I take this waste product in our society and turn it into a value-added product?" To find out, he's set up an experiment where he feeds dried food waste from a student cafeteria to fish in freshwater tanks and uses the fish poop to grow Boston Bibb lettuce. The concept is called "aquaponics," a combination of fish farming and hydroponics (growing vegetables without soil). Though not new, this is the first time it has been tried with post-consumer food waste to feed fish. 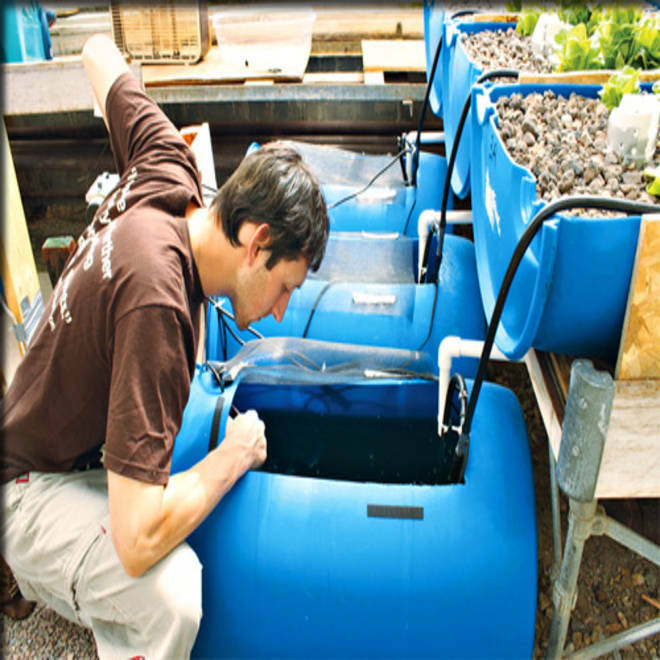 Most aquaponic systems, Amadori said, spend about 50 percent of their operating budget on commercial fish feed, which is typically pellets made from ground up fish, corn, and vitamins. So, while systems such as the Massachusetts Avenue Project in Buffalo, N.Y., and Growing Power in Milwaukee, Wis., are great socially and environmentally, "they are having trouble making a profit," Amadori said. His experiment is set up in a greenhouse where tilapia, a hardy freshwater fish that will eat just about anything, is raised in half a dozen 55-gallon barrels holding 20 fish each. The cafeteria food waste is ground up, dried, and broken up into pellets that are fed to the fish in three of the tanks. The other fish are fed commercial pellets as a control factor. Temperature-controlled water from the fish tanks is cycled into graveled-filled containers where the lettuce grows. "The gravel bed has bacteria that convert the fish waste into plant food and then the plants remove that and the water returns (to the fish tank) clean," Amadori explained. The experiment has been running for about four months. The fish won't be harvested until they weigh around a pound, at about one year of age. The lettuce, however, is abundant. "I'm making 18 heads a week and it is delicious," Amadori said. "It tastes just like the lettuce you buy at the grocery store."